Address: Hrvatin 21, 71000 Sarajevo, Bosnia and Herzegovina. To get to our Hostel from the Bus/Railway station you can take a tram No. 1. The tram station is located in front of Railway/Bus station. The price of the ticket is 1.80 KM per person (0.90 Euro) which you can buy in front of the tram in the small shop or inside of the tram of the driver. Once you buy the ticket make sure to validate it at the validating machine in the tram or you can pay a fine of 15 Euros (30 KM). Keep an eye out for thieves you as tourists are targets for pickpocketing so stick close to the front of the tram! We are located around 4km or 2.5 miles from the Main Bus/Railway station. You should get off on a tram stop named Vijecnica, that is the seventh station from the railway/bus station. Once you get off from this stop, you should be able to see the yellow National Library building on your left and a bridge on your right. Cross this bridge to your right! Once you cross the bridge you should see a small park with sandbags in the middle, go straight through him, than you should see a long straight street named Avdage Sahinagica street. To make sure you are on the right street, one end of the street should be looking directly towards the middle of the yellow National Library building and you should go towards the other end of the street, so opposite of the yellow National Library building. Once you reach the end of that long straight street go right, after that take the first turn left to Hrvatin street. The street should be going up! 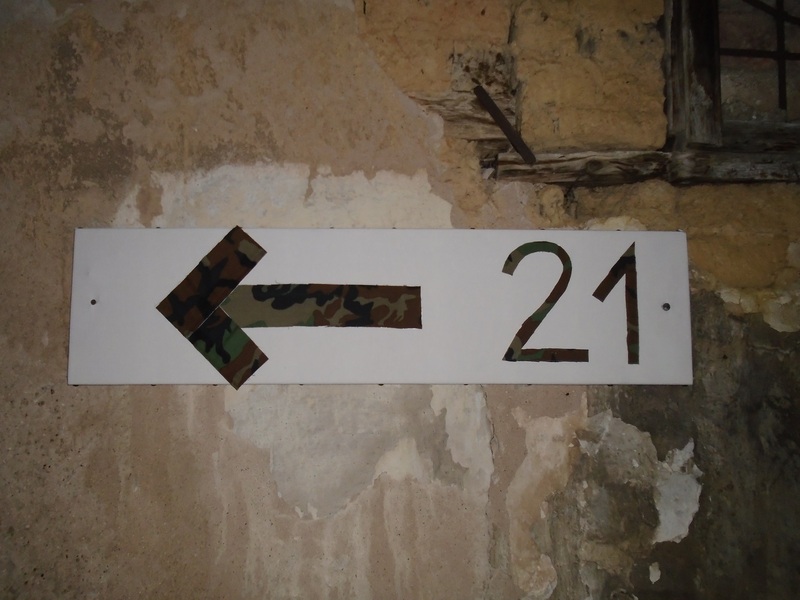 Once you walk up that street take the first turn left and at the end of it you will see an old house and on the wall of that house a white sign with a camouflage arrow and number 21 pointing to our hostel. You can also use the taxi transfer from the Railway/Bus station. Max cost should be around 5 Euros or 10 KM. Just give the taxi driver the address Hrvatin 21 and tell him that it’s close to the beer factory. If you are arriving from Serbia or Montenegro you will probably end up here! This bus station is located approximately 12 km or 8 miles from our hostel. The easiest way to reach us from this bus station is to take a taxi for the price in the range of around 15 Euros or 30 KM. Alternatively, you can walk for 300 meters to a local bus stop (to the DOBRINJA quarter) to get to the trolleybus station and buy a ticket for 1.80 KM (0.90 Euro) per person. You can buy the ticket in the small shop in front of the trolleybus or inside of the trolleybus from the driver. Once you buy the ticket make sure to validate it at the validating machine in the trolleybus or you can pay a fine of 15 Euros. Keep an eye out for thieves you as tourists are targets for pickpocketing so stick close to the front of the trolleybus! Take the trolleybus no.103, and exit at the last stop on TRG AUSTRIJE. Once you get off the trolleybus at TRG AUSTRIJE, look for a small tunnel/arch which should be just next to the Japanese embassy. Go through that arch. This is the beginning of Franjevacka street. Keep walking straight and you will see a red church to your right, this will confirm that you are on the right path. After you pass the church you will see a big red building on your left which is the beer factory of Sarajevo. Again keep walking until you pass the beer factory and in front of yourself towards the left you should be able to see some garbage containers. Opposite from those containers you should see a street named Hrvatin street which goes up! Take that street! Once on Hrvatin street take the first turn left and go that way until you reach the end. Once you reach the end of that turn you will see an old house and on the wall of that house a white sign with a camouflage arrow and number 21 pointing to our hostel. The airport is located approximately 12km or 8 miles from our hostel. Taxi is the best, easiest and most commonly used way to get to our hostel from the airport. It should cost around 15 Euros (30 KM) one way. Just give the taxi driver the address Hrvatin 21 and tell him that it’s close to the beer factory. There are other ways to reach us from the airport, but we do not recommend them because they are way too complicated and you will probably end up losing yourself and both your time and money!